As Labor Day approaches and everyone gets back from vacation, productivity seems to be top-of-mind for both employees and managers alike. This edition of #FridayFinds will help you re-connect with the pulse of the industry and find the productivity that you need, in an engaging working environment. Knowing what employees are thinking could be an HR specialists’ bets or worse dream. As people analytics dive further into the needs and wants of employees and how technology can leverage this key information to help create engaging experiences, this particular startup aims to identify subtle changes in what employees think about compensation or product road maps, or how they feel about specific leaders can often be accurate predictors of future productivity or attribution. Glint’s app works in tandem with a company’s existing human resources management systems, and it can be programmed to send requests for feedback when certain events occurs—such as a change in team management, the completion of a big project, or product launch. The startup is focused on companies with more than 1,000 employees and it has signed approximately 100 companies as customers, including United Airlines and FICO. We know that not everyone receives feedback in the same way. Some people can get extremely defensive when the feedback they’re getting differes entirely from what their self-perception. Based on a study published in the Academy of Management Learning and Education, Margarita Mayo and her research team investigated how MBA students react to feedback they received about their leadership competences from their peers, noticing some differences in the way that women receive feedback, as opposed to men. We found that women more quickly aligned their self-awareness with peer feedback, whereas men continued to rationalize and inflate their self-image over time. That is, in our survey, women were a lot more sensitive to peer feedback than men. Ending on a positive (and delicious) note, it seems that pizza was the answer to all of HR’s problems, we just didn’t know it until now. In his upcoming book, Payoff: The Hidden Logic That Shapes Our Motivations, Dan Ariely recounts an experiment involving employees at a semiconductor factory at Intel in Israel. 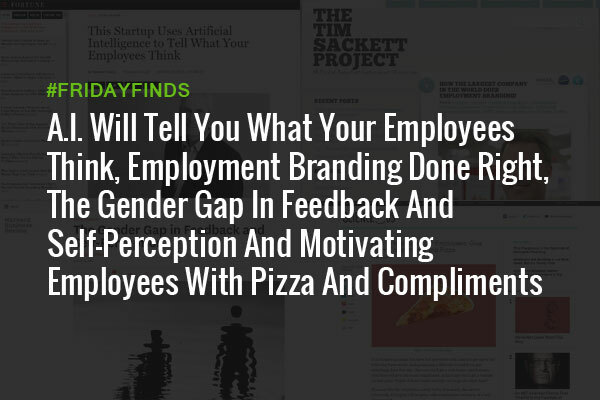 During this experiment, employees got one of three messages at the start of their workweek, each promising a different reward if they get everything done that day: One said they would get a cash bonus, another said their boss will give them a rare compliment and a third one said they would get a voucher for free pizza. It seems that, after the first day, pizza proved to be the top motivator, increasing productivity by 6.7 percent over the control group, thereby just barely edging out the promise of a compliment (in the form of a text message from the boss that said “Well done!”). Thank you for sharing this wonderful and informative piece. Indeed, the ability to understand employees’ perceptions and thoughts are highly significant for HR to effectively streamline HR measures and employee engagement. And I believe more businesses will start to embrace the AI offered. Good on Walmart for including their CEO in their employment branding video. It gave a personal and interactive feeling and lets us see the face of who’s behind it makes it better to attract high quality, top retaining talent. Definitely something businesses can learn from for their next employment branding video! Thanks again for this article, and looking forward to more. Cheers. Thanks Samantha! Appreciate the support!